Alaska produces an unusually great number of crowd-rocking and groove-inducing musicians and bands for a state that only has a population of less than 800,000. What you also may not know is that Alaskans love their music as much as they love fishing, skiing, hiking and a good local brew. The following is a round up of the top seven places to see and hear local tunes and national acts in the Last Frontier. 1. Alaska State Fair – Late August through Labor Day weekend, the Alaska State Fair is a 10-day celebration of everything about the Great Land: food, agriculture, farming, shopping and lots and lots of music. Every day of the fair features a long line up of local and out-of-state musicians on the main stage, including regulars such as Hobo Jim, a pioneer of Alaska folk music. Each year, the fair hosts one or more internationally known bands such as Creed, Air Supply and Styx. 2. Taproot Public House – Taproot started as a small café buried in a south Anchorage strip mall. A packed schedule of live performances by top-notch Alaskan musicians was its claim to fame and still is, although it has moved into a much larger location. Taproot is Anchorage’s premier location for those seeking a combination of a big neighborhood bar with a lineup that every music lover wants to experience. 3. 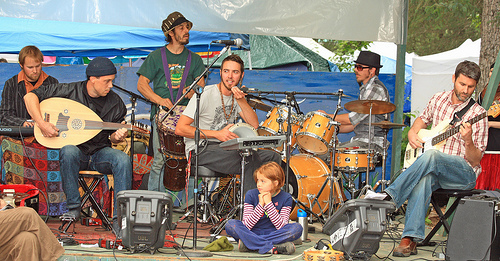 Girdwood Forest Fair – An annual music and arts festival tucked away in the ski town of Girdwood, just south of Anchorage and under the great Mount Alyeska. This event kicks off every year during Fourth of July weekend with a fun parade and continues with three days of non-stop music by local and visiting bands on two stages. 4. Salmonstock – This popular music festival takes place over three days in Ninilchik, just a stone throw from Homer and about a two-hour drive from the Kenai Princess Wilderness Lodge. Revel in the greatness of wild Alaska salmon as you dance and sing at this family-friendly event with a long list of fantastic performances from morning to night. Last year’s festival featured Brandi Carlile as the headliner. 5. Copper River Wild’s Salmon Jam – This festival also celebrates Alaska’s Salmon; but, let’s face it, Alaska salmon is great enough to warrant two music festivals! This festival is a celebration of the communities that thrive along the Copper River as much as it is a celebration of the fish. At this event, enjoy music from local and national bands in one of the most scenic locations in the state. 6. Fairbanks Summer Arts Festival – This two-week summer affair in Fairbanks is just minutes from the Fairbanks Princess Riverside Lodge. A Fairbanks tradition since 1980, this event takes place under the midnight sun on the University of Alaska Fairbanks campus, with more than 1,000 attendees, guest artists and workshops in music, visual arts, literary arts, theatre arts, culinary arts, dance and healing arts. The Summer Arts Festival’s variety of offerings makes it a top attraction for locals and visitors alike. 7. 49th State Brewing Company – Just outside Denali National Park in Healy, this popular restaurant and brewery found the perfect way to combine music, beer and good food on a couple of different occasions. For summer solstice weekend, the brewing company hosts their annual Solstice Fest, introducing new beer, food specials, vendors, bands and all the fun you can fit into approximately 22 hours of daylight. Just a little later in the summer, in August, this venue hosts their version of the traditional Octoberfest, which they have named Augtoberfest. Though it is a beer-focused event, there is fun for the entire friendly during the day, with entrance to music shows for people ages 21 and up after 10 p.m. Spend the night at the Denali Princess Wilderness Lodges, and end your fun day in the comfort of a warm room and plush bed.